Young nurses are all taught the concept of nurse patient advocacy. But when they get out into the real world of hospital practice, they’re often given little or no help in figuring out how to actually practice it. Advocating for patients can boost your professional image and enhance the personal satisfaction you get from nursing. But it can also put you in a position of conflict with doctors or other nurses involved in the care of your patients. Being successful at it requires the careful use of your “people management” skills. The privacy rights of the patient are observed. Regardless of social or economic position, every patient is treated with the same level of dignity. Your patient is educated to make informed choices on possible tests and procedures, and that he or she receives strong emotional support while they are being cared for. A somewhat more complicated ethics rule of the ANA specifies that you must take action against an illegal, impaired or incompetent practice you observe by any other member of the staff that puts the patient in danger. What action you should take as a nurse in this type of situation is left a bit unclear, however. Taking on the role of nurse as patient advocate can mean that you’ve got to stand your ground even when it isn’t easy. When a patient does not want to take a medication the doctor has prescribed, for example, your role should be to ensure that the patient is making an informed decision and support it. Doctor’s often don’t respond well to that. 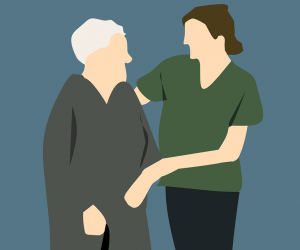 Decisions made at the end of life can also put you on the spot as a nurse patient advocate. Family members frequently disagree with each other about prolonging life in terminal illness situations. It’s important for you as an advocate to make sure that the patient’s wishes are followed, whether the family agrees with them or not and whether or not they make sense to you as a professional. But despite the challenges, becoming a patient advocate nurse can ultimately gain you more respect from other members of the clinical team and enhance the personal satisfaction you get from nursing. Patients are often confused in today’s complex healthcare environment, and your role as an advocate can make you their most important adviser. And taking that kind of leading role can help you better accomplish the goal you probably went into nursing for: to reduce patients’ physical and emotional suffering, and to protect the dignity of those under your care.